I expected to be sad and mixed up during this healing process. What I did not expect is to feel like a legitimately crazy person. RBS is my funny way of trying to sum up how I feel, but it feels more important than an Etsy shop here or a road trip there. Instead, I feel polarized at the moment. My entire adult life, I have had two very distinct sides pulling at my personality. 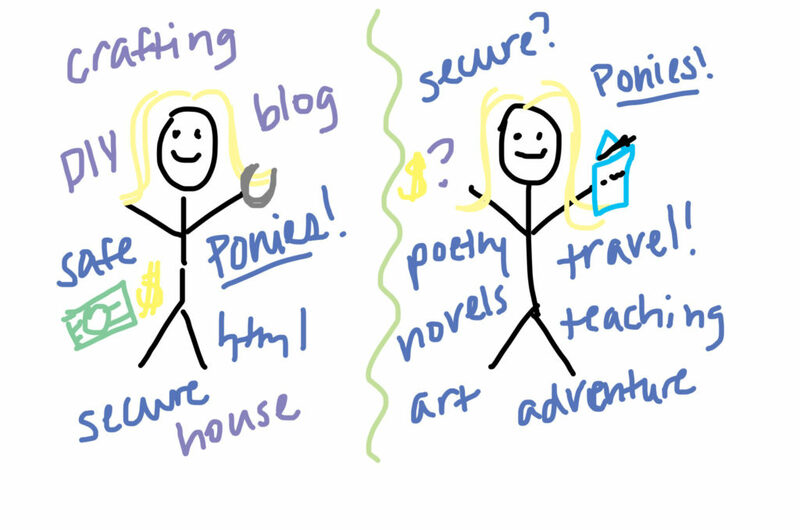 There’s the side that most of y’all know… the crafting/blogging/DIY/pony loving seeker of a stable, secure life. This Lauren had a back up plan for the back up plan. It was the reason I got an English teaching degree instead of a straight up creative writing. It has led to lots of other choices in my life as well. Safety Lauren is the main voice of this blog. My other side, artsy Lauren, still shows up here from time to time… much more lately than before. This is the person who ran rampant during my college years when money and responsibility were just a threat in the future versus an actual reality. Travel, creative writing, reading and the arts dominated my life then. Of course there were ponies too (always ponies), but it was more something I loved and did than something that drove me forward. Artsy Lauren’s heroes were writers, teachers and professors from college. I put those folks on a pedestal. I used to fill entire pages of notebooks with song lyrics and poetry from memory. I wrote two lines of writing per 1 college rule. I read all the time, and everything I could get my hands on. I wrote half as much as I read. 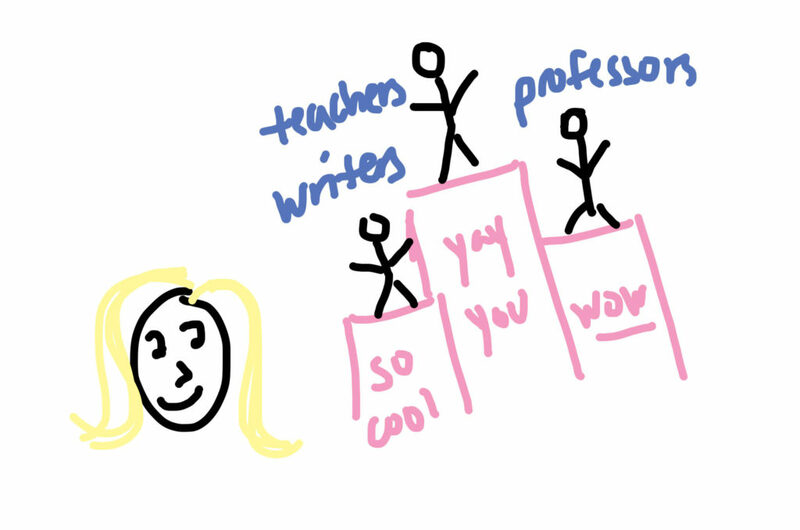 The plan was to be the Bohemian english teacher that everyone looked up to – total Dead Poets Society style. I would teach high school English for a few years, get an advanced English degree of some kind and eventually propel myself up to the level of writer that I wanted to be. Easy peasy. Working in high schools though, was not like I thought it would be. I should have expected the children to be bratty and self absorbed (most were), but I didn’t expect that so many teachers would behave as if they were in high school themselves. I had to follow a dress code, watch the way I talked and what I said and bring a bagged lunch to school every day. It felt like I would be perpetually stuck in high school for the rest of my life. I loved high school when I was a teenager, but I didn’t want to build a life there. Even though I finished out my degree in college, I never got my teaching certification and took my 1st job as a web designer… never looking back. Artsy Lauren began to be shut into a box. It happened slowly, but after I graduated I abruptly stopped reading for a few years. I watched TV a lot (really, really stupid TV). I worked and hung out with my soon to be husband and friends. We moved to Massachusetts, and I slipped even further away from my creative self. 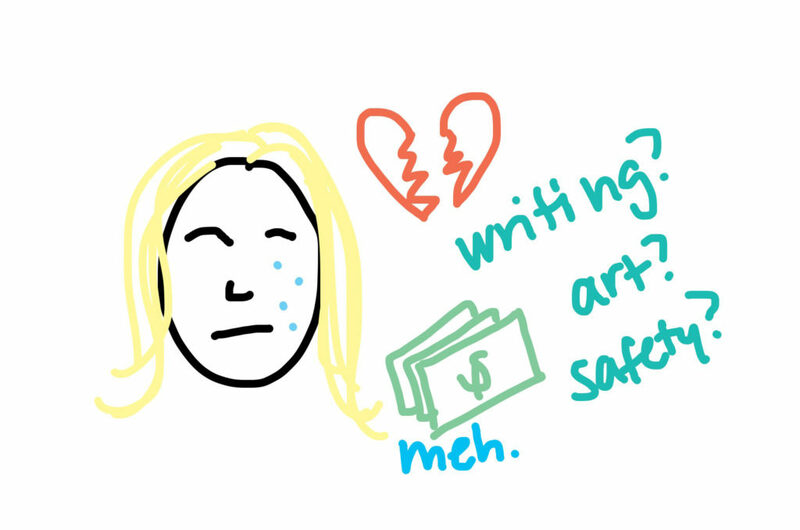 I stopped blogging/writing entirely, and worried about work performance and job titles and promotions. We moved to Texas, and I started riding horses again. Career became necessary for me to pay for the nerd horse and his accompaniments. We bought a house, and I wanted it to look nice. The writing itch came back, so I started blogging. It allowed me a little bit of time every day to allow myself to write and be somewhat creative. I don’t regret any of the choices that safety Lauren pursued. 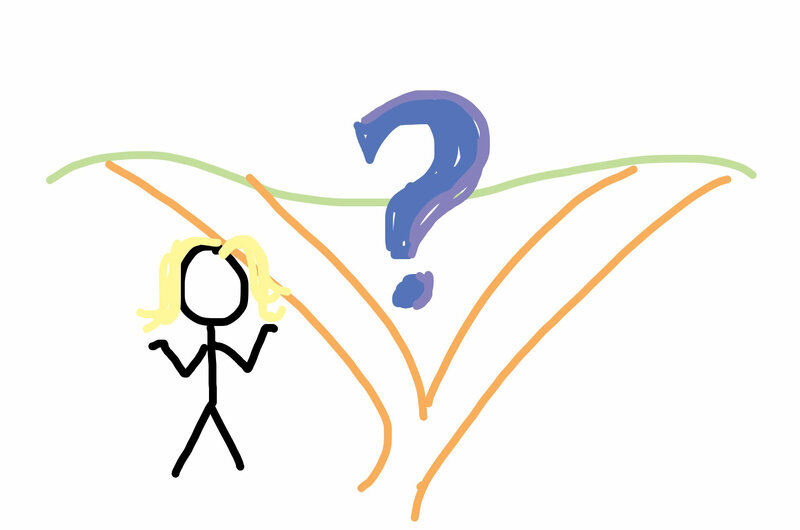 This path that I’ve chosen is a part of me now, and despite being super mixed up… I like myself. But I’ve made the safe choice my entire life, and it did not save me from tragedy. My first inclination was to ditch all the safe choices and go after the dreams I was too scared of in my youth with a wreckless abandon. I believe that would be doing myself a disservice though, because despite my desire to be spontaneous… I am a planner. I need security. I need some of those safe choices in my life. Surely there has to be a way to balance this all out? Now I just have to figure out where to go. Adult Horse Coloring Book Pages – Nerd Horse Etsy Shop! I am a recovering pathological impulsive spender (otherwise known as an idiot!) who is still paying for the mistakes I made at 21… Safety KateRose is in charge 99% of the time now haha. We are so similar, it is kinda scary. I took the creative writing route in college though because being a teacher just sounded horrid (with the exception of summer vacation). I can relate to this post a lot though. My 8-5 embraces basically none of my creative side to the point that it is easy to forget that the creative side exists. I came across a bunch of my writing from undergrad the other day and the memories of it were so foreign it was as if someone else had written it. I took several years off from reading after graduation as well and am just now getting back into it. I just need more hours in the day! Ahhh, the duality of (wo)man! I think everyone feels this way to some extent. My mom was an artist by education and trade, my father a business man. Thus born into me was both sides as well. And those ponies really do eat a lot of money. I’ve done like you, chosen a stable job in the business world, while enjoying ponies and my jewelry making hobby on the side. Every so often I toy with the idea of having an etsy shop but never really follow through. I think your a beautiful writer, and see no reason you shouldn’t pursue something you love that you’re good at. Maybe to start, you set aside a few hours each week to hone your craft, while still working the stable bill paying job. Then you can have a portfolio on hand if/when you’re ready to leap into the writing world. Yes, I think duality is something that is pretty much a universal struggle. I guess I am thinking about it a lot more lately because my life has been so split in half that it’s almost an opportunity to chase after something else. Would love to talk to your friend! Will shoot you an email. I totally get this, and have felt similarly. I just had this conversation with myself in my head on the way to work this morning, actually. I’ve been dreaming of taking improv and comedy classes and such, and writing a book. I started off in journalism and moved over to marketing and PR when the magazine industry tanked and I was downsized. I miss it sometimes. Amen. I can totally see you in comedy by the way! I love this post! 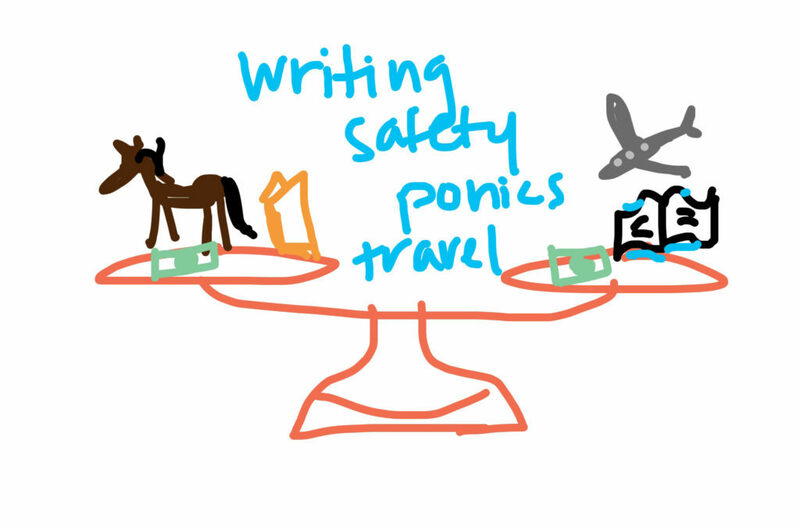 Horses vs. travel has always been the big one for me. They both take the same amount of finances and time and it seemed you couldn’t have one without the other. You definitely can do both though – I’ve ridden in 8 different countries and found stables in all sorts of weird corners of the world. I’m an English teacher abroad though so the salary doesn’t always afford luxuries like showing and owning a horse, there is saddle time if you’re willing to look. Plus with HTML + teacher’s degree and you could find work in a lot of different places without having to commit to much time in one place (aka, keep the party moving and see the rest of the world). Of course the hardest part would probably be leaving Simon, but if you could find a temporary fix like a lease I’m sure you would never regret travelling for a year and writing your “Eat, Pray, Love” (only better with ponies in it), and be able to return to your life now and find that Austin is always the same to come home to. But security is great. I’ve been on the road for years now and this year made a conscious effort to settle down. The body and mind crave security but I think they crave adventure too. It’s a damn hard decision either way, but if you need a devil to whisper 100 reasons why you should in fact F everything and hit the road, I’m happy to help. Ask yourself: what would you do if you won the lottery? Do that, even if it has to be on a smaller scale. I see where you’re coming from. My creative side used to read more than any human should have time for (i.e. during all meals, during homework (don’t ask), during chores…never figured out how to shower and read, though), and when I wasn’t reading, I was writing or drawing. Now, I work with horses – sometimes it feels like 24/7. I love the life I’ve chosen – although I can hardly say it’s financially “safe” and that fact makes me cry sometimes – but I wonder about other paths as well. Family and friends have always tried to encourage me to draw more. Still, it wasn’t until this past winter that it really started to sink in. I kinda picture myself making art into my “fun money” fund someday, instead of the “hurry gotta pay bills somehow” fund that it currently is. Anyway, if you ever want to chat with/throw ideas around with a fellow artist, I’d love to talk! Maybe we can help inspire each other? I can totally relate to the duality. Like you I have chosen (and will likely continue to choose) the “safe” route. Planning and security hold me back from a career change that has the potential to make me happy. I’m not sure that work happy is enough to out way the life changes I’d have to make though. In opening your Etsy shop it seems as though you’ve found the beginning of a way to incorporate a bit of your other self. There is a way to balance, its just trial and error finding how exactly that balance looks to you or manifests itself in your life. Silencing the voices is never the answer but yea.. not easy. That is a lovely article. Such a good article! It makes me think about all the times people have looked at me like I’m crazy when I say I don’t want to work full time with horses. I would go crazy! I really like what Exploringdressagebiomechanics had to say above about finding the right balance of security and creativity. I have never gone through a loss like the one you have experienced, but reading your post it struck me that you really seem to be going through a search for identity. I mean, before Tim’s passing, your identity was pretty fixed. You were Tim’s wife, Mother to Simon, BT, Elliot and Pasquale, you lived in Austin and worked at XYZ company. You had a sense of who you were, where you belonged within that framework. Now everything has been turned upside down. There are new questions on the table. I would just caution you to be careful with yourself. Everything is still so new. I’m sure you are still reeling in the aftermath. Pursuing your dreams with ‘wreckless abandon’ isn’t always all it is cracked up to be. I’ve always wondered why bloggers don’t turn their blogs into books. Great material, pictures and it’s already written! Look at “humans of New York”. Just pictures with a short story, but he made a book out of it too. I think we all have “warring sides” to ourselves. Sometimes it’s a true civil war, sometimes it’s just a civil disagreement. Balance is something I strive for and sometimes I do a better job of it than others. I think many of us squashed a bit of our creative side as life pressed down on us. I look back at my college art and think, holy crap I did that?! I’m slowly pulling back some me time, and as kidlets grow, getting them involved. My mom sat on some serious art talent her whole life, so all I can say is maybe it is a good time to take a little risk. You have little tying you down, other than needing to feed and shelter nerd horse. Do a little bit of all of it? I don’t think balance is an end result, but more of a neverending process …. I used to play it safe. Growing up I was the nerd, the straight-A student, the overachiever. I still am all those things. But the best thing I ever, EVER did, was to do the absolute most insane thing I could have ever thought of: to drop an entire career, a man I was practically engaged to at the time, and the plans of a future (yet boring) life together, just so I could run off with the man that had always been the love of my life. To a life where I knew I would never be bored. To a life that has brought so much good and joy and magic. 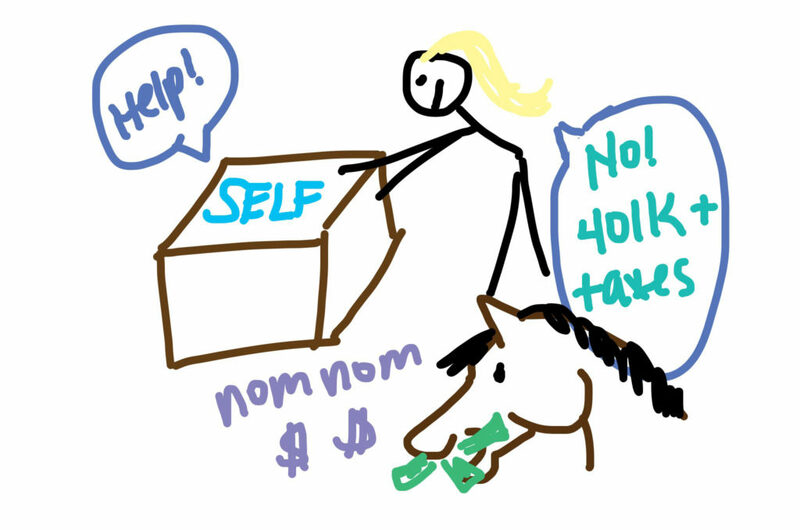 Note: I still planned it – my “running off” involved 6 months of planning, visiting (to be 100% sure this is what I REALLY wanted), of saving up money for an overseas move, of getting my horse’s situation squared away, and refocusing my career. Would the other life have been easier and more stable? Probably. Would I have made a different choice, knowing the outcomes? HELL NO. So when people tell me they have a dream, something that they have always wanted to do, I tell them to go for it. When one door closes, another opens. Sometimes what would have been impossible at another moment in time suddenly becomes an opportunity that must be seized. I agree with the comment that this is a universal theme – though I would call it what we should do versus what we want to do. Life needs both. It’s hard to get the mix right sometimes. i definitely see value in getting a little existential every now and then and really thinking deeply about the choices we make and why they matter (or ultimately don’t matter). sometimes it really is ok to let go a little and be a little reckless. generally things work out. but yes, balance is also key.